The Great Gatsby, a film that depicts all that was beautiful and not so beautiful about the 1920s, debuts this weekend. Part of what made the whole era so grand, however, was not the money that would never stop or the incredible music that seemed to flow from everything, but the cars that the monied class drove. I actually went to see The Great Gatsby in an attempt to document all the cars that were featured. Just in case, I also contacted Warner Bros.' media folks in the hopes that they would provide a list of the vehicles that made an appearance, if for nothing but for the sake of accuracy. They insisted there was only one. That’s not a joke. In a surreal e-mail exchange, they could only speak of one car, Jay Gatsby’s “custom Duesenberg,” regardless if I asked about the others. A list was not forthcoming. Did they see the same trailers I did? No matter, as I was off to the movies. There were indeed Duesenbergs, at least two of them, as well as a Packard, a Buick, probably a Dodge, a Victoria Brougham, and most certainly a Rolls-Royce. There were absolutely more than that, as you can see above, but most were seen in brief glimpses and quick cuts, making positive identification a bit difficult, to say the least. If you’re sure of what you’ve seen, please feel free to add them to the comments. That being said, there are even greater and more beautiful cars from that era that have never made an appearance in cinemas. Unbound by restrictions of tradition, conventional thought, or safety regulations, style was allowed to run wild. In honor of that illustrious decade, here are five cars you’ll want to drive if you want to be just like Gatsby himself and how much you'd need to pay for them today. Hoover was president, the stock market was boiling over, and what was the worst that could happen? 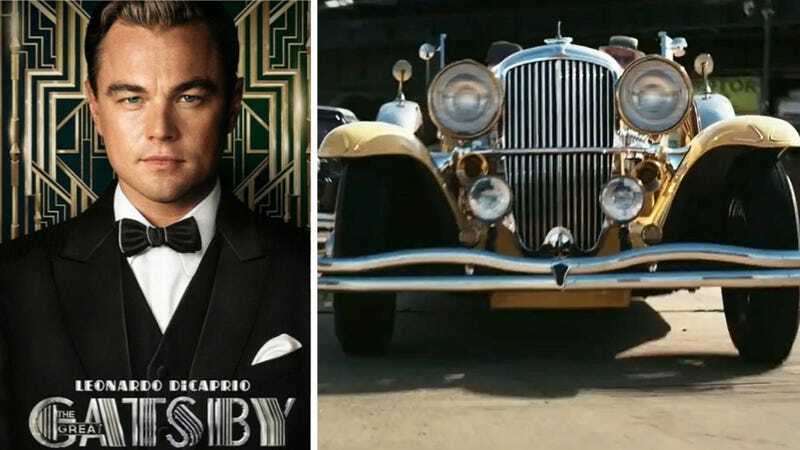 The reason why Rolls-Royce is so associated with Jay Gatsby, at least in the novel, is because a large crux of the film (spoiler alert, though not a big one) is predicated on Gatsby trying to pull off an air of British sophistication. And, the thinking goes, what could be more British and sophisticated than a Rolls-Royce? A lot of things, in this era, actually. Money seemed to be just pouring out of every orifice before the stock market crash in 1929, and the demand for Rollers was so great in the United States that the company actually built a second factory in Springfield, Massachusetts. A little emblematic of Gatsby himself then, really, as an American that wants everyone to think otherwise. This is the type actually featured in the film- never mind that it’s actually a Rolls-Royce in the book, and the movie is supposed to take place in 1922 and the particular Duesenberg J that appeared is a replica of a 1929 model, which would draw the credibility of the entire production into question when it comes to the vehicles and yes never mind all that at all. Duesenberg is synonymous with the ostentatious wealth and the Golden Era before the Great Depression, and one could say it was suitably cast in the role, if you don’t pay attention to things like period accuracy at all. Duesenbergs are big, fast, and were known to top 100 mph when such things were nearly unheard of for something that could go on the road. The company was so emblematic of the era, in fact, that like many others it never made it through the Great Depression. It’s a shame, as more cars need that beautiful exhaust system. The list of words that pop into anybody’s head when they see this car should include the words “imposing” and “speed.” It has the rare ability to look like it’s moving near the sound barrier even when sitting still, with its fluid lines, enormous grille, and aerodynamic wheel covers. There are quite a few instances of speed throughout the Gatsby story, and the Phantom I Aerodynamic Coupe looks like it tells them without even making a sound. The Phantom I is good for looking fast, and the Duesy can do pretty well in a straight line, but sometimes you need something that’s a bit ugly and that can quickly deal with the roads in the real world. That’s where the Bentley comes in. Not only is it quintessentially British, but it could actually take the real bendy, rutted streets in the 1920’s, as it proved on the streets of Le Mans, France, where it won four times in a row. It’s perfect for any kind of escape, especially if your names are Tom and Daisy. Alright, so this isn’t a car, but just look at it. Originally built in 1936, but based off of a 1930 Henderson, it is perhaps the pinnacle of Art Deco automotive design. With flowing, swept-back bodywork and that wide leather seat, it is the future of our past in a perfect package. Imagine showing up to a party in West Egg on that – you’d be the talk of the town. Lucky for you, though, only one exists, so you certainly one have to contend with the commoners and their Silver Ghosts. They made over 7,000 of those. Feh! It must be for peasants! What do you think is the best car for your gilded Twenties life? Post your suggestions in the comments! Top shot credit Warner Bros.